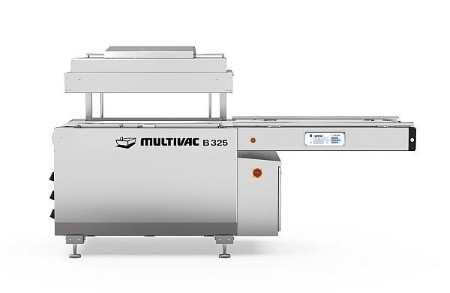 MULTIVAC introduces a cost-efficient entry-level model with a high cycle output to its chamber belt machine portfolio at IFFA 2016. The new machine, B 325, is aimed particularly at industrial packagers in the food sector who are deciding to invest in an automatic chamber belt machine for the first time. The new machine combines all the advantages of MULTIVAC’s chamber belt machine technology in a space-saving machine design and, with a cycle output of up to three cycles per minute, it is one of the fastest machines in its class. With a chamber size of 1000 x 630 x 180 mm (W x D x H), it is suitable for the packaging of fresh meat, sausage and ham products, and cheese. The chamber is equipped in the front and back with two pluggable sealing bars and can be loaded on both sides. For particularly tall products, the model is op-tionally available with a chamber height of 250 mm. The B 325 is equipped as standard with a double-seam sealing from above. The machine can alternatively be equipped with a single-seam sealing from above and below for packaging in aluminium film pouches or especially thick film pouches. For easier servicing, the pluggable seal-ing bars can be removed without using a tool. The B 325 can be addi-tionally equipped with a perforator, which enables the excess length of the film pouch to be manually cut off. Alternatively, the machine is availa-ble with a cutting unit which automatically cuts off and suctions film pouch necks. The B 325 stands out for its hygienic design with MULTIVAC Hygienic DesignTM. The elevated cleaning position of the chamber lid makes ac-cess to the chamber easier for cleaning and servicing. The B 325 fulfils the requirements for protection class IP65 and can be expanded into a shrink packaging line with MULTIVAC shrinking and drying units. The B 325 can be equipped with various pump combinations depending on the desired output. In addition, it offers equipment options such as anti-roll bars on the transport conveyor for the packaging of round products. The MULTIVAC Group has approximately 4,700 employees worldwide, with nearly 1,600 of these employees based out of its headquarters in Wolfertschwenden. With more than 75 daughter companies, it is represented on all continents.